Hawaii Prep Athletic Director and Big Island Interscholastic Federation cross-country coordinator, Steve Perry, has released the number of state slots that will be awarded to the BIIF runners at the Championships on Saturday, Oct 24. 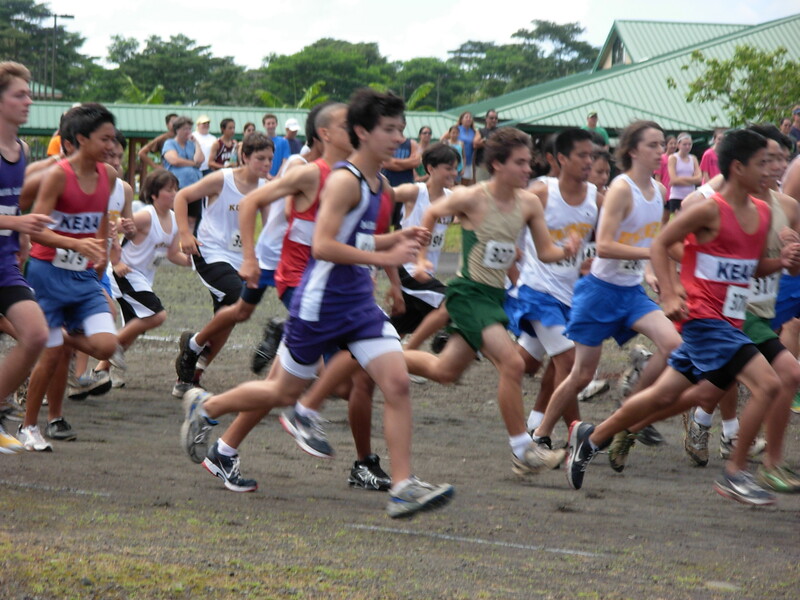 The HHSAA office has released league information for the 2009 HHSAA XC Championship. The event will be held on Saturday, October 31st @ 9:00am on the Island School campus (Kauai). Each race will have 160 runners (max). Top-3 teams from BIIF Championship meet (Oct. 24th) – 21 runners max. the MIL will have 26 boys and 27 girls on Kauai October 31. More than 150 student athletes, coaches and parents meet this past Saturday at the University of Hawaii Campus Center for a daylong conference on how to facilitate a more positive experience for those youngsters in sports. FEAHY, Facilitating Extraordinary Accomplishments in Hawaii’s Youth, brought together a variety of guest speakers that were divided into two morning sessions, one for coaches entitled Developing Competitors and the other for student athletes called Becoming a Triple Impact Competitor. Key note speaker was University of Hawaii Rainbow Wahine basketball coach, Dana Takahara-Dias. 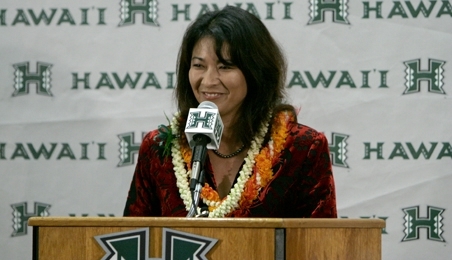 Takahara-Dias is a former Rainbow Wahine player, 1985-1988, under legendary coach Vince Goo brings the same energy and wisdom as her former coach. By her sophomore year at UH she had been given a full athletic scholarship, then in her junior year she became the starting point guard. At the start of her senior year she was selected by her teammates to be Team Captain. “What I learned from team sports has brought me here today,” Takahara-Dias said. After graduating from UH and playing basketball for the Rainbow Wahine Takahara-Dias spent 15 years as a special needs teacher. Prior to signing on as the new UH basketball coach, Takahara-Dias, was working for the City and County of Honolulu as the director of customer service. “I have a very simple goal as a player and now as a coach and that is to improve every single day,” she said. Following Takahara-Dias’ keynote address participants were able to hear additional speakers on a variety of topics aimed at enhancing the student/athlete experience. “Most of the speakers were primarily talking about ball sports, so I had to think outside the box as swimming is more of an individual sport,” Schad said. 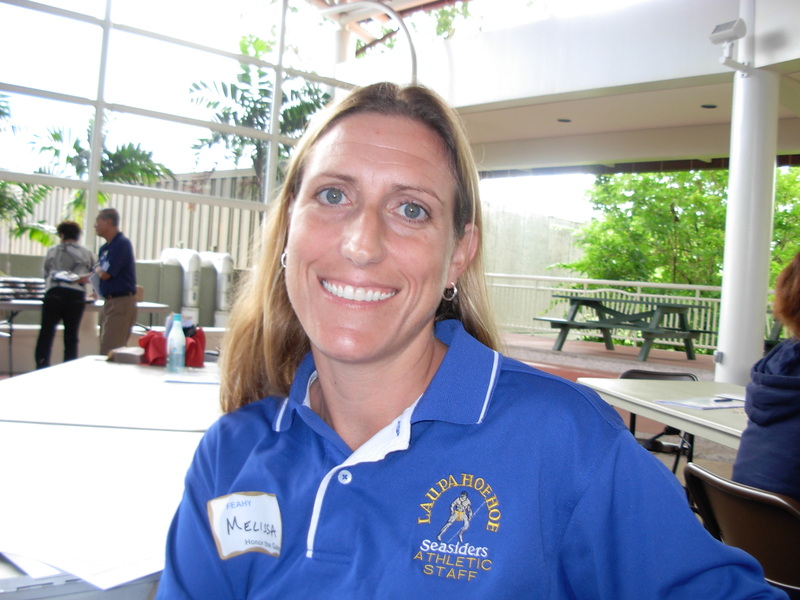 Volunteer track and field coach from Waiakea High School, Kamuela Johansen, also came away with ideas that could enhance his coaching. “I wanted to learn how to become a better coach so that the athletes can gain a better appreciation for the sport that I teaching them,” he said. “I liked the many “do’s” and “don’t” for coaches. There are many verbal and non verbal ways that coaches communicate and sometimes with just a roll of the eyes or a nod of the head that can convey negative feelings towards the player,” Johansen said. Hilo High freshman, Chris Torrison, who plays soccer for the Vikings, came to learn how to be a better player. “The speakers were helping us with ways we can boost our emotional feelings to help us become a better player,” he said. “One thing they told us was to look in the mirror and repeat to yourself no one can change you, but you,” Torrison said. The panel discussion was moderated by ESPN Hawaii Radio personality, Josh Pacheco and kicked off a morning full of motivating and positive discussions geared at helping to enhance youth sports in our community. The FEAHY conference was hosted by Positive Coaching Alliance who believes that the most important aspect of youth sports participation should be the teaching of life lessons by their coaches. PCA nationally works to train youth coaches in the positive ways of working with young people in athletics. PCA Big Island has been providing live, research-based training workshops and practical tools development for several years, according to spokeswoman Jeannie Yagi. For more information on the PCA go to their web site at http://www.positivecoach.org. Keaau’s Daniel Brooks and Hilo’s Shalila de Bourmont continued to run well at Big Island Interscholastic Federation cross-country meets this season as both captured top individual honors at Waiakea on Saturday. At the start of the boys three mile race Brooks opened with at quick pace and rapidly separated himself early on from the rest of the field. Books won the race in 17 minutes and 24 seconds with Hilo’s Tyde Kaneshiro claiming second. For Hilo’s Kaneshiro it was perhaps his best race thus far. “My teammate, Billy (Ray), and I wanted to beat Keaau’s number two runner (Shannon White) so we tried staying with him most of the race,” Kaneshiro said. Just before the two mile point Kaneshiro separated himself from a pack made up of Ray and White, along with Kamehameha’s Casey Chai, as Kaneshiro opened up a large gap between himself and third place. Kaneshiro attempted to catch Brooks in the last half mile of the race, but ran out of gas with about 200 yards to go. “Mentally I couldn’t grasp the fact that I could catch him (Brooks) and I gave up rather than suffer through the pain,” he said. Kaneshiro finished in 17:40, just 14 seconds behind Brooks to claim his highest placing finish in his young prep career. “I feel great physically and mentally, this is the best I have ever felt during a race,” he said. Chai took third, 18:04, followed by Ray, 18:11; Hilo’s Johann Kuiper, 18:11; White, 18:12; and Waiakea’s Frank Chi in 18:12. Second place whet to Waiakea’s Kaitlyn Chock, 21:38; and Kelsie Kobayashi, 21: 43; while Kamehameha’s Bronte Kaneakua was fourth, 21:54; and Keaau’s Dean Nishimura-Thornton finished fifth, 22:06. While Kaneakua wasn’t very satisfied with her fourth place finish, Nishimura-Thornton was excited with her fifth place time. “This was probably the best race I’ve had this season as I tried to stay with the front pack for as long as I could,” Nishimura-Thornton said. Last year Nishimura-Thornton was consistently in the top five of each race leading up to the BIIF championships and she did it as a freshman. The young Cougar fizzled at the BIIF championships dropping out of the top ten. “This year I want to put all my focus on the BIIF’s and peak in time for that race,” she said. Hilo swept the boys and girls team titles with a surprised Viking coach, Bill McMahon looking on. “I tell you, I never really expected this (winning team titles) but these guys and girls are really tough in putting it all together,” McMahon said. On the north end of the island it was Kohala playing host to the BIIF West Division with a pair of Dragons taking top individual honors. Chris Mosch, who won it all at Kamehameha two weeks ago, won the boy’s race, while teammate Tia Greenwell, the two time defending BIIF champion, won it all for the girls. Mosch’s major challenge came from Makua Lani’s Dylan Hardie-Jordan who tried to stay with the senior from Honokaa for most of the race. Greenwell had little opposition in her desire to retain a third league title and easily took the girls race in 20 minutes and 56 seconds. Teammate Athena Oldfather captured second in 21:28, followed by Makua Lani’s Grace Choe, 22:46, and Hawaii Prep’s Zoe Sims, 22:56. Honokaa won the boys varsity race with Ka Makani taking the girls team title. The Big Island International Marathon is offering an “Early Bird” entry for all three races in which they host. Participants can receive 50 percent off the full marathon (26.2-miles), half-marathon (13.1-miles) or the 5K (3.1-mile) run/walk if mailed in by November 1. The “Early Bird” acts as an incentive in getting people to sign up well in advance for the March 21, 2010 event and allows them enough preparation time to successfully complete the respective distances. 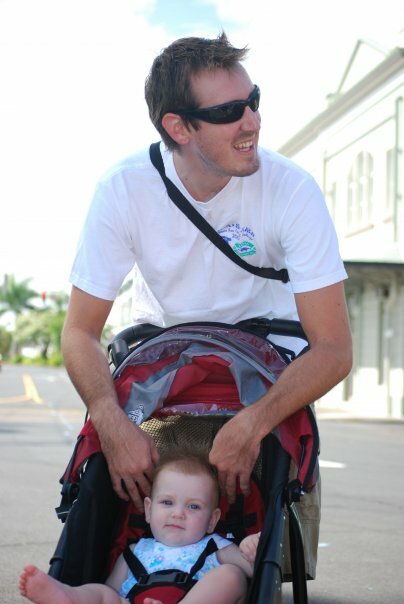 During the marathon and half-marathon races a volunteer, Ryan Mason, will follow the last runner on his bicycle. Mason informs the aid stations and police officers alone the route that the last runner has passed. This allows these sections of the course to be reopened to the general public. Mason does a service for the BIIM event as it is no easy task for someone who is a competitive cyclist. To accomplish this task he needs to spend nearly five hours as the trail bike sweep. Growing up in Long Beach, California, Mason got into traditional team sports at an early age as he played baseball from the time he could hit a ball off a tee, up through high school. “I enjoyed playing baseball and the camaraderie with other players, however I grew to feel awkward and out of place in the game,” Mason said. Mason was a pretty good pitcher on the local baseball teams and he even tried his hand at football and golf, before discovering his love for surfing while in junior high. “I really enjoyed surfing as it was much different than the other activities I was involved in earlier and it brought a strong connection between me and nature,” he said. In high school Mason broadened his athletic experiences by running cross-country and track and finally cycling. “During my junior year in high school I started my first job at Jax Bicycle Center (Long Beach) as a cashier. I developed a good relationship with the other employees including the manager of the store who knew of my running experience and helped in the procurement of my first road bike,” Mason said. In 2003, at the young age of 22, Mason moved to the Big Island in his quest to expand his life experiences. 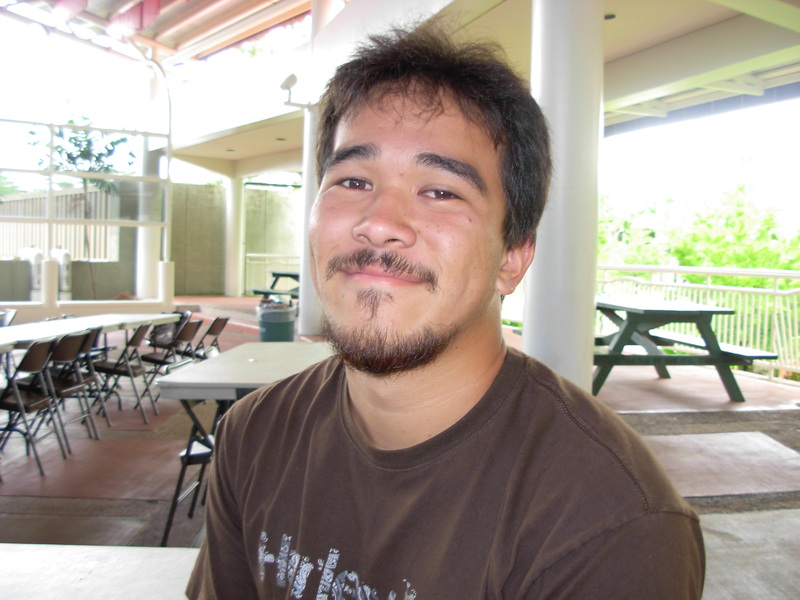 Six years ago he landed a job with Chris Seymour at the Hilo Bike Hub as a mechanic while he continues to pursue a degree in Philosophy and in Linguistics at the University of Hawaii Hilo. “The completion of two degrees will hopefully come to fruition this spring,” he said. Since age 16 Mason’s life has been filled with cycling which has now become his primary form of exercise. “I’ve become immersed in not only a new sport, but a new culture. That is one thing about cycling that is so amazing and which continues to renew my love for the sport. Cycling is used as a means for multiple purposes, which is one thing that many sports cannot claim. Some use bicycles primarily for transportation, others for recreational use and fitness, while others integrate it within their lives as a competitive activity,” Mason said. Mason will get out and ride for about two hours, and sometimes up to four or five hours, three to five times per week, depending on his school schedule. “During the summer I was lucky to be able to ride much more than during the academic season. There are five formal rides in Hilo which go on early in the morning where riders meet up and cycle together for about two to three hours,” he said. What helps Mason is that during the school year he will write out a riding schedule every three weeks in advance. “Having a written schedule seems to be one of the best ways of keeping myself accountable. September to January is the off season in cycling and so mountain bikes come out as well as the crazy, brakeless, fixed gears. This provides for a break from the training regimen and a little fun with a different rig,” he said. At 28 years of age Mason has a busy life, working a part time job, attending school full time and raising a two year old daughter, Rylie. “It is great to be living in Hawaii where you can be outdoors year round. I have never understood the craze over using aerobic gym equipment when the weather is nice. It s too bad there is no indoor rock climbing gym in Hilo, which is an indoor exercise that I do enjoy,” he said. And Mason offers the following advice for those who would like to get into competitive cycling. “Cycling specifically, can be a very taxing sport physically, mentally, and emotionally. I know many people who tried it, got very engaged in the sport, and then just up and quit a year or two later because of the time involvement and the unpredictability of strength gains. The classic mistake in cycling is to shift to a very hard gear and pedal at a slow cadence (RPM) and feel like one is getting a good workout, especially aerobically. This is actually a bad way to train your body. Maintaining a cadence of 70 to 90 RPM during the ride will help build the body and heart’s strength, the muscle growth will follow,” he said. So if you’re looking to expand your exercise routine and thinking of giving cycling a try you can drop by Hilo Bike Hub in Hilo and ask for Ryan Mason. And if you ever see a bike rider bringing up the rear of a marathon event remember to say thank you for someone who is truly giving of their time to help an event run more efficiently.